Mae of Font and Frock and Ruth of Silver Screenings are hosting another year of the Reel Infatuation Blogathon. I participated last year with articles about two characters played by Lew Ayres: Michael Rand in Night World from 1932, a pathetically besotted millionaire in a redeemable pre-Code film, and Jerry Flynn, The King of the Newsboys in 1938, a lovable newspaper distributor from an excellent Code film. 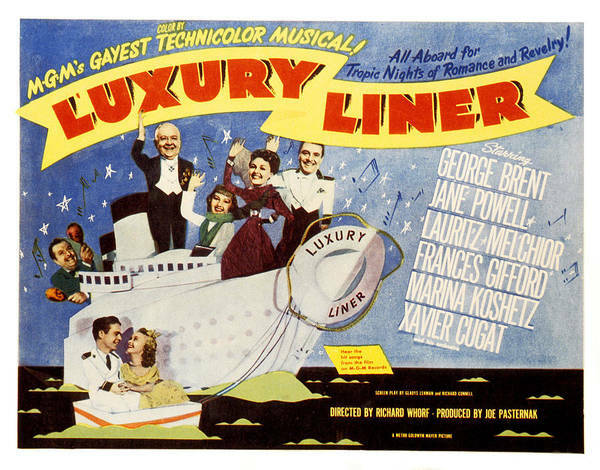 This year, I am participating by writing about one of the leading men in one of my new favorite movies, Luxury Liner from 1948. This movie is a carefree musical starring Jane Powell, George Brent, Lauritz Melchior, and Frances Gifford. The character about whom I am going to write is Dennis Mulvy, a young officer of the ocean liner’s crew and Jane Powell’s casual beau. Dennis is played by Thomas E. Breen in his second credited role. This actor’s surname will doubtlessly seem familiar to frequent readers of the Pure Entertainment Preservation Society. Some readers might be forming opinions about possible family connections between young Thomas Breen and Joseph I. Breen, the head of the Production Code Administration and a frequent topic here at PEPS. As a matter of fact, Thomas Eugene Breen was Joseph I. Breen’s youngest son. Naturally, my choice of this character has nothing to do with the fact that his father is my favorite person in old Hollywood. You probably don’t believe that any more than I do. I try to be as unbiased as possible, but it is hard to judge family members of people you like fairly. We must determine whether or not Tommy Breen has merits of his own. The only way to do so is to board the good ship Luxury Liner and join the all-star cast on a magical, musical cruise! Polly Bradford (Jane Powell) is an enthusiastic sixteen-year-old who boards at an expensive girls’ school because her widowed father is a sea captain who is frequently kept away by his job. When the movie begins, Polly enjoys a happy four days with her father while he is in port, starting with him watching her performance as the leading man in her school’s all-girl play. She displays her dramatic acting talents and her bright singing as she warbles the cheerful “Spring Came Back to Vienna.” On their last evening together, Captain Jeremy Bradford (George Brent), a handsome man whom all Polly’s classmates admire, takes his adoring daughter to a production of Verdi’s opera Aida, starring Polly’s idol, the famous Scandinavian tenor Olaf Eriksen (Lauritz Melchior). Captain Bradford tells his daughter that Mr. Eriksen and other members of the opera company are going to sail on his next cruise, which is headed for Rio de Janeiro. Little does the good captain know that his daughter has been planning to join him on this cruise for months, Mr. Eriksen’s presence being only an added inducement. When Captain Bradford brings his daughter back to the boarding house to bid her a final farewell before going to sea, Polly asks him to take her with him; however, no amount of charm, persuasion, or acting can convince him to take her out of school. He leaves the forlorn girl to continue her studies, promising to take her on a future trip. He bids her a fond farewell, telling her to learn to spell and thinking that the matter is closed. Imagine his surprise when, a few hours out of port, a stowaway who is brought into his office turns out to be no one besides his own daughter, looking very cute in a plaid shirt, jeans, and pigtails! They have a private word together, and Polly is somewhat concerned by her father’s harsh reaction to her decision to illegitimately join him during his sea voyage. He is very upset that she disobeyed him, and he decides to teach her a lesson. Much to Polly’s displeasure, he denies his relation to her in front of the one of the ship’s crewmembers, and he forces her to work for her passage like any stowaway. Captain Bradford and all the other people aboard the cruise ship have no idea what is in store for them with Polly Bradford aboard! Aside from Polly and her father, there are a lot of very interesting passengers aboard this ship. Two of the principle members are the two opera singers who are going on a South American tour, Olaf Eriksen and his soprano nemesis, the flamboyant, flirtatious, and very obnoxious Zita Romanka (Marina Koshetz). There is also a very beautiful war widow, Laura Dene (Frances Gifford), who decided to take this cruise to think about her engagement to a businessman she doesn’t know very well. It’s several days before she realizes that her fiancé, the self-centered, self- assured Charles G. K. Worton (Richard Derr), has come on the cruise, as well, even though he promised to go ashore before the ship sailed. Xavier Cugat, the famous South American bandleader, gives a cameo appearance with his band as a musical addition to the passenger list. In addition, there are two prominent crew members, Chief Officer Carver (John Ridgeley) and Dennis Mulvy, a younger member of the crew. This brings us to the main topic of this article, my Reel Infatuation choice. In the first scene when Captain Bradford is at sea, he is trying to find accommodations for a last-minute passenger, Charles Worton. While he is on the telephone, a young officer with deep auburn hair, a tall, thin frame, and a crisp white uniform enters in a militaristicly serious manner. He stands before the captain’s desk and says, “Captain?” but the latter says, “Just a minute.” The camera closes up on the young man’s face, and we get a good look at him for the first time; he has a fair complexion, refined features, and warm brown eyes. This is Thomas E. Breen in his second credited role during his first year as an actor. After the captain has finished his telephone conversation, Mr. Mulvy tells him that he has discovered a stowaway aboard. Captain Bradford tells him to bring him in, but he is shocked to see that the ragamuffin whom Mr. Mulvy sternly orders into the room is his daughter! After they have talked privately, Captain Bradford tells Dennis to take charge of the stowaway, which he firmly does, much to the spirited young lady’s chagrin. “Stop shoving me!” she says once they are in the hall. “All right then, move along!” Dennis firmly replies, determined to assert his authority. Later, Polly is forced to peal potatoes in the kitchen as part of her punishment for stowing away. Well, perhaps peeling isn’t as descriptive of what she is doing as butchering is. She is determined to do a bad job as an act of defiance. Dennis comes up to her and offers her a peeler instead of the knife she is using, saying “Hey, you could peel them a lot better with this.” After looking at the tool for a moment, she says, “I don’t want to peel them better.” Sitting down across from her, Dennis pulls out a notepad. He asks, “What’s your name? I mean your real name. Oh, I don’t want to know for myself. I have to make an official report.” When Polly doesn’t answer right away, he prompts her by saying, “Name, please?” “Polly,” she says, then, hesitating about her last name, adds, “Polly Murphy.” Dennis readily accepts the alias and says, “Miss Murphy, I’m sorry I was rough with you. You know, I’m really not a brute.” “You’re not?” she says playfully. “Oh, no. Honest I’m not. It’s just that, when you kicked me – well, I guess I lost my head.” “Oh, you lost your head?” she teasingly replies. “Uh-huh,” he shyly replies. “Then go look for it!” she snaps. He looks slightly annoyed and, shrugging, gets up and leaves. After he’s gone, Polly picks up the tool he gave her and starts using it on the potato with better results. That scene is one of the best exchanges in the movie. I really like the dialogue, and it is delivered so well by both the actors. I could describe and quote many other scenes with Dennis Mulvy in detail, but I think I shall dedicate the space instead to a little history about Thomas Breen. He was born in Washington, D. C., on January 3, 1924. He was the sixth and last child of Joseph I. Breen and his wife, Mary Rose Breen nee Dervin. At the time of Thomas’s birth, Joseph Breen was working as a newspaperman on the staff of a Catholic welfare organization. In 1931, when Thomas was ten years old, his family moved to Los Angeles because his father had gotten the job of public relations man for the Motion Picture Producers and Distributors of America. Within three years, his father had become the first head of the newly formed Production Code Administration, making him one of the most influential men in the film industry. During his youth, Tommy enjoyed surfing at his family’s home in the Malibu colony. When World War II began, Thomas Breen joined the Marines. He was a member of Edson’s Raiders, an elite strike force. When the Raiders landed on the Japanese-inhabited island of Guam, their landing craft was destroyed, and most of the men died. Thomas was thrown onto the island, where he received shrapnel from the enemy and was partially crushed by Marine tanks. Fortunately, the twenty-year-old survived this horrible battle, his second and last encounter, and he was soon at a military hospital in Pearl Harbor with the Breen family friend Spencer Tracy at his side. However, the doctors were unable to save his right leg, so he wore a prosthetic leg for the rest of his life; I have heard that he learned to surf again as a civilian in spite of this injury. In 1948, four years after the ghastly beach attack, Thomas E. Breen was signed by Metro-Goldwyn-Mayer as a supporting actor. The producer of his first movie, Three Daring Daughters, in which Tom played an uncredited role with two lines, was Joe Pasternak, a friend of Thomas’s father. During the two years in which Thomas Breen was under contract at MGM, he made six appearances in major films, three credited and three uncredited. In 1951, he was in Jean Renoir’s Technicolor drama, The River, in which he played his only role as a leading man; the filming was on-location in India. Mr. Renoir, unlike the filmmakers at MGM, did not know who Thomas’s father was; he cast him in the role of Captain John because the character, like the actor, had a prosthetic leg. After this movie, Thomas Breen retired from acting and became a contractor and housing developer, working on the board of the Del E. Webb company. He died in Oregon in 2000 at the age of seventy-six. His memory is well-loved by his three children and his grandchildren. This is the only one of Thomas Breen’s credited films from MGM that I have seen. I have also seen his walk-on appearance in Three Daring Daughters, but there is very little of him in it. When I learned that he had made several films, I became very eager to see them, since I always want to learn more about the Breen family. 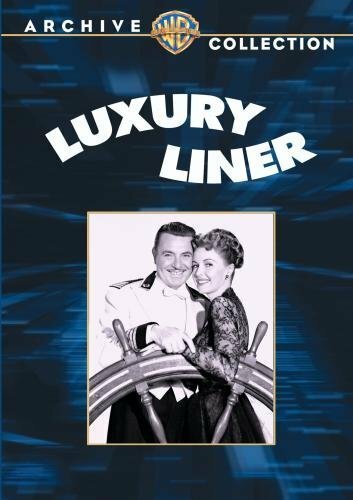 For Christmas, my sister bought me a DVD of Luxury Liner, which I had expressed a desire to see. It seemed like a movie I would love just for itself; Thomas’s presence was an added attraction. We watched the movie for the first time on Christmas Day, and I loved it immediately. Since then, it has become one of our favorite movies. We watch it every few weeks. There is so much to love about it. It is such wholesome, care-free entertainment, and it’s always easy to watch. No matter what your mood is, it can always lift your spirits. This musical cruise has a swell soundtrack for sailing the seven seas. When Polly is sent to the kitchen, she starts a rousing musical performance of “Alouette,” getting every member of the kitchen staff to sing and dance in a rousing chorus that brings “Alouette” around the world. Polly also sings the Gavotte from Manon in French, accompanying herself on the piano. Later, she sings “The Peanut Vendor” with Xavier Cugat’s orchestra accompanying her, interspersing the Latin melody with excerpts from opera arias. Olaf Eriksen sings “Helan Gar,” a rousing Scandinavian drinking song, with a stein of beer in his hand and a full, powerful voice. Later, he rehearses an aria while the admiring Polly watches. Zita Romanka sings a comical rendition of “I’ve Got You Under My Skin” while banging out an accompaniment on a grand piano in Captain Bradford’s office. In addition, the Pied Pipers, the popular singing foursome, sing a jazzy rendition of “Yes, We Have No Bananas” as entertainment in the Mermaid Room. Later, they accompany Olaf Eriksen with rhythmic harmonizing as he sings “Helan Gar.” Whether you like opera, South American music, or American jive, there is music you will like aboard this ship! There is a really charming romance between Captain Bradford and Laura Dene. The sweet widow immediately feels sorry for Polly when she meets her scrubbing floors; she asks the captain to stop treating the “poor, fatherless waif” as a stowaway, not knowing that the imaginative young lady is the captain’s daughter. Thus, she pays for Polly’s passage, invites her to stay with her in her suite, and buys her some pretty clothes. When Laura learns the truth about Polly’s identity, she sympathizes with the compassionate father. They quickly grow to be good friends, and they spend a lot of time together during the cruise. Meanwhile, Polly has befriended Charles Worton, her roommate’s persistent fiancé. She helps him in his attempts to woo Mrs. Dene, not knowing that Laura is being annoyed by him and that her own father is interested in the charming lady. Meanwhile, Zita Romanka is aggressively pursuing the handsome captain. Polly has a rather colorful love life of her own, although most of it is in her imagination. It is clear from the beginning that she is rather infatuated with Mr. Eriksen. One day, she manages to have a private word with him. She is scrubbing the floor in front of his cabin, and, since she is blocking the door, he has no choice but to talk to her. She says, “You don’t know it, but I’m possibly your greatest admirer. I have all your records, and I play them over and over and over again. Oh, Mr. Eriksen,” here she pauses to blow a lock of hair out of her face, “you send me. In fact, you’re my Sinatra.” Mr. Eriksen seems flattered by most of this speech but a little bewildered by this last statement. Later, she is sitting in the Mermaid Room with Charles Worton. When she sees Mr. Eriksen, she tells Mr. Worton that she has to go over and say hello to him. “Ask him to join us,” Charles urges. “Well, I’d better not,” she replies seriously. “He’s so jealous.” After one meeting, she seems to think that Mr. Eriksen is an admirer! However, her only real romantic possibility is with Dennis Mulvy. Their relationship is not always the friendliest one; Polly frequently is cool to Dennis, who is often rather tried by her. When Polly sees Mr. Eriksen in the Mermaid Room, she and another woman persuade him to sing. While he is preparing to sing “Helan Gar,” Dennis comes in and sees Polly sitting at Mr. Eriksen’s table. He purses his lips, his arms akimbo, and walks over to her. He tells her that she has no right to be there, and she tells him that her passage fee has been paid. “It has, huh?” he says suspiciously. “By who?” “A friend,” she says, glancing toward Mr. Eriksen with the intention of giving Dennis the wrong impression. “And these clothes?” Dennis continues. “A present,” she replies. “From the same friend,” he deduces. He is very concerned by this, and he earnestly says, “Miss Murphy, that’s not right.” “Why not?” she says with mock seriousness. “Why not? Why not?! Why, I hate to see a young girl taking a step which might lead – I don’t know where.” You have to appreciate Mr. Mulvy’s concern for her. It shows that he really cares about her. “Give them back,” he continues. “Right now?” she says with a mischievous glance. After all, this is the son of the head of the PCA, so he seems a little embarrassed. He quickly says, “Oh, no, not right now. But as soon as you can.” She giggles. They go back and forth between being friends and being enemies, but Dennis always seems to have admiration and concern for Polly and her wellbeing. He is an honorable young man, and he always turns up at the right time to add depth and color to the plot. Thomas Breen was featured heavily in the publicity photographs for this movie. He was in most of the group publicity pictures, plus he and Jane Powell were in a lot of shots together. In addition, there are a lot of candid shots of them together on the set. They seem to have been very good friends. I have included a gallery of publicity and candid photographs from this movie. Take a look at the many photographs of Tommy. In this role, Tommy had a very good opportunity to display his personality and his talent. He is in seven scenes, and he has quite a bit of dialogue, much of which is very clever. The role is a mixture of humor and seriousness. He’s very funny with his humorous dialogue and actions. The funniest part is when he wrinkles his nose at Mr. Eriksen, thinking that he’s Polly’s sugar daddy. “He made a face at me,” Mr. Eriksen says to Polly, who tells him that he’s just jealous. Later, Mr. Eriksen makes a face back at Dennis, who is taken aback. At other times, he is very seriousness. He has a very bright smile, which he uses on occasion. He inherited a fondness for smiling at the camera from his mother, who always flashed the cameras a bright smile, unlike her husband, who avoided candid photographs if possible. At first glance, Tom Breen doesn’t look much like his father. Upon closer analysis, however, you can see a lot of family characteristics. Like Joseph Breen, Thomas had a round face, a fair complexion, and intense eyes. He was taller and more slender than his father. Joe Breen had very dark hair in his youth; Tommy may have inherited his red hair from his mother. However, both father and son had somewhat wavy hair. I suppose what really shows the family connection between Thomas Breen and the head self-regulator is his mannerisms. When he purses his lips together in frustration because of Polly, he looks very much like his serious father. When he smiles, you can see the same twinkle in his eye which was caught in a few candid photographs of Mr. Breen. In addition, they have the same kind of voice, which was relatively high but very intense. Some may think that Thomas Breen got his contract just because a Seal of Approval from his father was mandatory for a film’s release, but I think that he had merit in his own right. I find him to be a charming, talented, and good-looking young man. I am very impressed by the way he compensates for his prosthetic leg. If I didn’t know about the injury, I wouldn’t guess that he had lost his right leg. I think that he had a very unique personality and a charming way of delivering lines. I think it’s a shame that he didn’t make more movies, especially with leading roles. My sister and I have thought of a lot of roles which he could have played. I think that he is an excellent addition to this movie, and I would like him even if he wasn’t the son of a man I greatly admire. What do you think of him? This movie was described as “MGM’s Gayest Technicolor Musical,” and I think that’s very appropriate. The tagline was, “All aboard for tropic nights of romance and revelry!” I find this movie particularly enjoyable because I am a girl who is very much like Polly Bradford; that is to say, I am a sixteen-year-old opera student. With a beautiful wardrobe, a loving father who is the captain, a faithful friend for a roommate, her idol opera singer aboard, an opportunity to sing with him, and a kind young officer to keep a close watch on her, Polly Bradford is a very lucky girl aboard this cruise. When does the next cruise leave? I want to book a stateroom on the Luxury Liner! We are raising our voices in classical song to help the sun rise on a new day of pure entertainment! ← “Babes on Broadway” from 1941: Young Stars Shine the Brightest! Thanks so much for participating in the blogathon! This is a wonderful write-up of character/actor/film. If it doesn’t convince people to watch it, nothing will. Thank you so much for your kind comment. I enjoyed participating in your blogathon. It was a wonderful opportunity for me to write about a film I’ve been wanting to review for a long time. This sounds like so much fun. Thank you for sharing it! Thank you so much for liking and complimenting my article. I appreciate your support! This is a great movie, which you can buy on DVD on Amazon. I know you would love it! I feel like such a dunce! I have seen, and enjoyed, both The River and Luxury Liner, but had no idea the same actor appeared in both films. An understandable choice for a reel infatuation. I’m glad that you have seen and enjoyed both these movies. I’ve seen “The River” too, and I like it a lot. However, I can understand how you could not notice that Thomas Breen is in both movies; he does look rather different in the 1951 movie. I’m glad that you like my choice for this blogathon. Thank you for commenting on my article! I want to book a stateroom on this liner, too! I loved your review. Your enthusiasm for this film is infectious, but judging by your description, it practically sells itself. Jane Powell is always a treat, as is Xavier Cugat. However, I was intrigued by your assessment of Thomas Breen; it sounds like he can hold his own against the more seasoned actors in this film. Thank you for joining the blogathon, and for bringing this gem of a film with you. I’ve never heard of it before, and now I can’t wait to see it. P.S. I saw your comment about the concert and I will take a closer look at it after this blogathon wraps up. I didn’t want you to think I missed it. Thank you so much for your kind comment. I’m so glad that you liked my article and that it has encouraged you to find this movie. It is sold in DVD form on Amazon, and the quality is wonderful. I look forward to receiving your response to my previous comment when you have the time. I like the picture you chose for my article on the roster, and I was happy to see that you began the article with a picture from “Holiday,” one of my favorite movies.